For other uses, see Scribe (disambiguation). A scribe is a person who serves as a professional copyist, especially one who made copies of manuscripts before the invention of automatic printing. The profession, previously widespread across cultures, lost most of its prominence and status with the advent of the printing press. The work of scribes can involve copying manuscripts and other texts as well as secretarial and administrative duties such as the taking of dictation and keeping of business, judicial, and historical records for kings, nobles, temples, and cities. The profession has developed into public servants, journalists, accountants, typists, and lawyers. In societies with low literacy rates, street-corner letter-writers (and readers) may still be found providing scribe service. One of the most important professionals in ancient Egypt was a person educated in the arts of writing (both hieroglyphics and hieratic scripts, as well as the demotic script from the second half of the first millennium BCE, which was mainly used as shorthand and for commerce) and arithmetic. Sons of scribes were brought up in the same scribal tradition, sent to school, and inherited their fathers' positions upon entering the civil service. Scribes were considered part of the royal court, were not conscripted into the army, did not have to pay taxes, and were exempt from the heavy manual labor required of the lower classes (corvée labor). The scribal profession worked with painters and artisans who decorated reliefs and other building works with scenes, personages, or hieroglyphic text. from the category of 'writings, & music'. 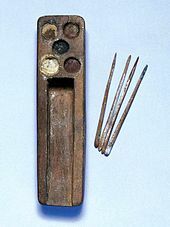 The hieroglyph contains the scribe's ink-mixing palette, a vertical case to hold writing-reeds, and a leather pouch to hold the black and red ink blocks. The demotic scribes used rush pens which had stems thinner than that of a reed (2 mm). The end of the rush was cut obliquely and then chewed, so that the fibers became separated. The result was a short, stiff brush which was handled in the same manner as that of a calligrapher. 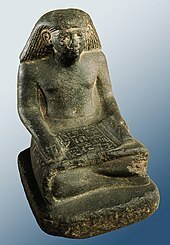 This early New Kingdom statue commemorates the scribe Minnakht ("Strength of Min") and demonstrates how ancient scribes read papyri – in a seated position on the floor with the text on their lap. In addition to accountancy and governmental politicking, the scribal professions branched out into literature. The first stories were probably creation stories and religious texts. Other genres evolved, such as wisdom literature, which were collections of the philosophical sayings from wise men. These contain the earliest recordings of societal thought and exploration of ideas in some length and detail. 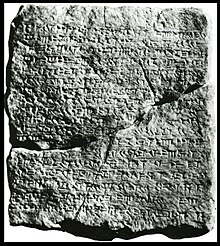 In Mesopotamia during the middle to late 3rd millennium BCE, the Sumerians originated some of this literature in the form of a series of debates. Among the list of Sumerian disputations is the Debate between bird and fish. Other Sumerian examples include the Debate between Summer and Winter where Winter wins, and disputes between the cattle and grain, the tree and the reed, silver and copper, the pickaxe and the plough, and the millstone and the gul-gul stone. An Ancient Egyptian version is The Dispute between a man and his Ba, which comes from the Middle Kingdom period. The Jewish scribes used the following rules and procedures while creating copies of the Torah and eventually other books in the Tanakh. They could only use clean animal skins, both to write on, and even to bind manuscripts. Each column of writing could have no less than forty-eight, and no more than sixty lines. The ink must be black, and of a special recipe. They must say each word aloud while they were writing. They must wipe the pen and wash their entire bodies before writing the most Holy Name of God, YHVH, every time they wrote it. There must be a review within thirty days, and if as many as three pages required corrections, the entire manuscript had to be redone. The letters, words, and paragraphs had to be counted, and the document became invalid if two letters touched each other. The middle paragraph, word and letter must correspond to those of the original document. The documents could be stored only in sacred places (synagogues, etc.). As no document containing God's Word could be destroyed, they were stored, or buried, in a genizah. 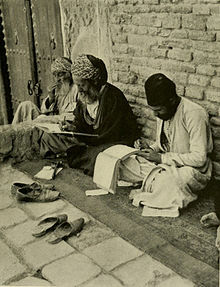 Sofers (Hebrew: סופר סת”ם‎) are among the few scribes that still ply their trade by hand, writing on parchment. Renowned calligraphers, they produce the Hebrew Torah scrolls and other holy texts. Until 1948, the oldest known manuscripts of the Hebrew Bible dated back to CE 895. In 1947, a shepherd boy discovered some scrolls dated between 100 BCE and CE 100, inside a cave west of the Dead Sea. Over the next decade, more scrolls were found in caves and the discoveries became known collectively as the Dead Sea Scrolls. Every book in the Hebrew Bible was represented except Esther. Numerous copies of each book were discovered, including 25 copies of the book of Deuteronomy. While there are other items found among the Dead Sea Scrolls not currently in the Hebrew Bible, and many variations and errors occurred while they were copied down, the texts on the whole testify to the accuracy of the scribes. The Dead Sea Scrolls are currently the best route of comparison to the accuracy and consistency of translation for the Hebrew Bible because they are the oldest out of any Biblical text currently known. Priests who took over the leadership of the Jewish community preserved and edited biblical literature. Biblical literature became a tool that legitimated and furthered the priests' political and religious authority. Corrections by the scribes (Tikkunei Soferim) refers to changes that were made in the original wording of the Hebrew Bible wording during the second temple period, perhaps sometime between 450 and 350 BCE. One of the most prominent men at this time was Ezra the scribe. He also hired scribes to work for him, in order to write down and revise the oral tradition. After Ezra and the scribes had completed the writing, Ezra gathered the Jews who had returned from exile, all of whom belonged to Kohanim families. Ezra read them an unfamiliar version of the Torah. This version was different from the Torah of their fathers. Ezra did not write a new bible. Through the genius of his ‘editing’ he presented the religion in a new light. In the Middle Ages every book was made by hand. Specially trained monks, or scribes, had to carefully cut sheets of parchment, make the ink, write the script, bind the pages, and create a cover to protect the script. This was all accomplished in a monastic writing room called a scriptorium which was kept very quiet so scribes could maintain concentration. A large scriptorium may have up to forty scribes working. Scribes woke to morning bells before dawn and worked until the evening bells, with a lunch break in between. They worked every day except for the Sabbath. The primary purpose of these scribes was to promote the ideas of the Christian Church, so they mostly copied classical and religious works. The scribes were required to copy works in Latin, Greek, and Hebrew whether or not they understood the language.These re-creations were often written in calligraphy and featured rich illustrations, making the process incredibly time consuming. Scribes had to be familiar with the writing technology as well. They had to make sure that the lines were straight and the letters were the same size in each book that they copied. It typically took a scribe fifteen months to copy a Bible. Such books were written on parchment or vellum made from treated hides of sheep, goats, or calves. These hides were often from the monastery's own animals as monasteries were self sufficient in raising animals, growing crops, and brewing beer. The overall process was too extensive and costly for books to become widespread during this period. Although scribes were only able to work in daylight, due to the expense of candles and the rather poor lighting they provided, monastic scribes were still able to produce three to four pages of work per day. The average scribe could copy two books a year. They were expected to make at least one mistake per page. Women also played a role as scribes in Anglo-Saxon England, as religious women in convents and schools were literate. Excavations at medieval convents have uncovered styli, indicating that writing and copying were done at those locations. Also, female pronouns are used in prayers in manuscripts from the late 8th century, suggesting that the manuscripts were originally written by and for female scribes. The scribe was a common job in medieval towns during the 10th and 11th centuries. Many would be employed at scriptoria owned by local schoolmasters or lords. These scribes would be working under deadlines to complete commissioned works such as historic chronicles or poetry. Because parchment was quite costly, the scribe would often create a draft of the work first on a wax or chalk tablet. ^ Harper, Douglas (2010). "the definition of scribe". Dictionary.com. Online Etymology Dictionary. Dictionary.com, LLC. Retrieved 6 June 2017. ^ Reuters (12 June 2003). "Women of letters doing write for the illiterate". smh.com.au. Archived from the original on 26 January 2018. Retrieved 25 January 2018. ^ Rice, Michael (1999). Who's Who in Ancient Egypt. London: Routledge. p. lvi. ISBN 978-0415154482. ^ Damerow, Peter (1996). Abstraction and Representation: Essays on the Cultural Evolution of Thinking. Dordrecht: Kluwer. pp. 188–. ISBN 978-0792338161. ^ Carr, David M. (2005). Writing on the Tablet of the Heart: Origins of Scripture and Literature. Oxford: Oxford University Press. p. 66. ISBN 978-0195172973. ^ a b Kemp, Barry J. (2006). Ancient Egypt: Anatomy of a Civilization (2nd ed.). London: Routledge. p. 180. ISBN 978-0415235495. ^ Clarysse, Willy (1993). "Egyptian Scribes Writing Greek". Chronique d'Egypte. 68 (135–136): 186–201. doi:10.1484/J.CDE.2.308932. ^ Budge, E. A. Wallis (1969). The Gods of the Egyptians. New York: Dover Publications. ISBN 978-0486220550. ^ "The Electronic Text Corpus of Sumerian Literature". Etcsl.orinst.ox.ac.uk. 2006-12-19. Retrieved 2017-03-09. ^ "Hebrew language, alphabet and pronunciation". 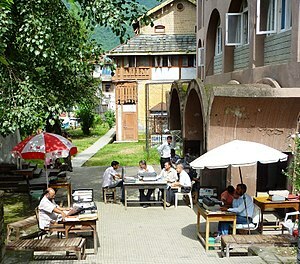 Omniglot.com. Retrieved 2017-03-09. ^ Metzger, Bruce M.; Coogan, Michael D. (1993). The Oxford Companion to the Bible (1st ed.). Oxford: Oxford University Press. ISBN 9780195046458. ^ Manning, Scott (17 March 2007). "Process of copying the Old Testament by Jewish Scribes". Historian on the Warpath. Retrieved 9 July 2018. ^ Johnson, Paul (1993). A History of the Jews (2nd ed.). London: Phoenix. p. 91. ISBN 978-1857990966. ^ Schniedewind, William M. (18 November 2008). "Origins of the Written Bible". PBS Online. Nova. Retrieved 9 July 2018. ^ Drazin, Israel (26 August 2015). "Ezra changed the Torah text". Jewish Books. Retrieved 9 July 2018. ^ Okouneff, M. (23 January 2016). Greenburg, John (ed.). The Wrong Scribe: The Scribe Who Revised the King David Story. CreateSpace Independent Publishing Platform. p. 146. ISBN 9781523640430. ^ Gilad, Elon (22 October 2014). "Who Wrote the Torah?". Haaretz. Retrieved 9 July 2018. ^ a b Pavlik, John; McIntosh, Shawn (2017). Converging Media: A New Introduction to Mass Communication. Oxford: Oxford University Press. pp. 66–67. ISBN 9780190271510. ^ a b c Murray, Stuart A.P. (2009). The Library: An Illustrated History. New York, NY: Skyhorse Publishing. p. 33–34. ISBN 9781602397064. ^ a b c d Lyons, Martyn (2011). Books: A Living History. Los Angeles: J. Paul Getty Museum. pp. 36–38, 41. ISBN 9781606060834. ^ a b Martyn., Lyons, (2011). Books : a living history. Los Angeles: J. Paul Getty Museum. ISBN 9781606060834. OCLC 707023033. ^ Science, Lady (16 February 2018). "Women Scribes: The Technologists of the Middle Ages". ^ "Female Scribes in Early Manuscripts - Medieval manuscripts blog". blogs.bl.uk. ^ Murray, Stuart. (2009). The Library: An Illustrated History. Skyhorse Publishing: New York. This article incorporates text from a publication now in the public domain: Easton, Matthew George (1897). "Scribes" . Easton's Bible Dictionary (New and revised ed.). T. Nelson and Sons. 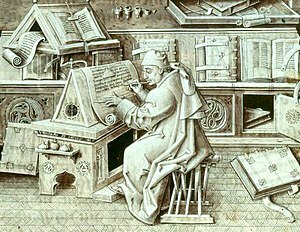 Wikimedia Commons has media related to Scribes. Wikimedia Commons has media related to Scribes of Ancient Egypt.